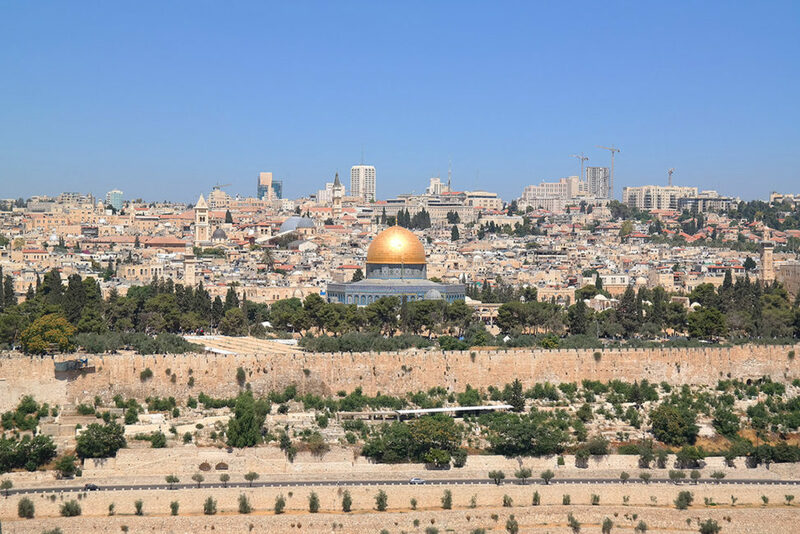 I recently returned from a two week mission adventure to Israel, and it was an experience like no other. Naturally, I’ve been asked by friends and family what I loved most, and I find it difficult to respond. 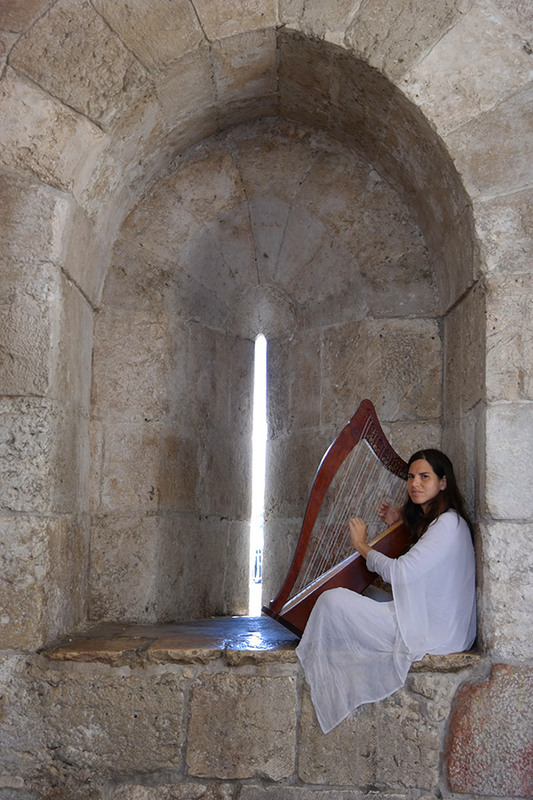 Spending so much time immersed in the history and culture of the Holy Land was mind-blowing. It’s hard to choose favorites when I loved just about everything that crossed my senses. 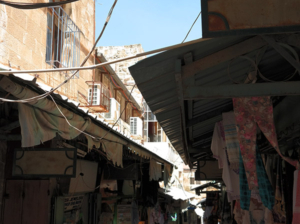 I will say, however, that the afternoon I spent exploring the Old City of Jerusalem was particularly special. It became evident very quickly why that one square kilometer of land is so controversial, contested, and coveted by so many. 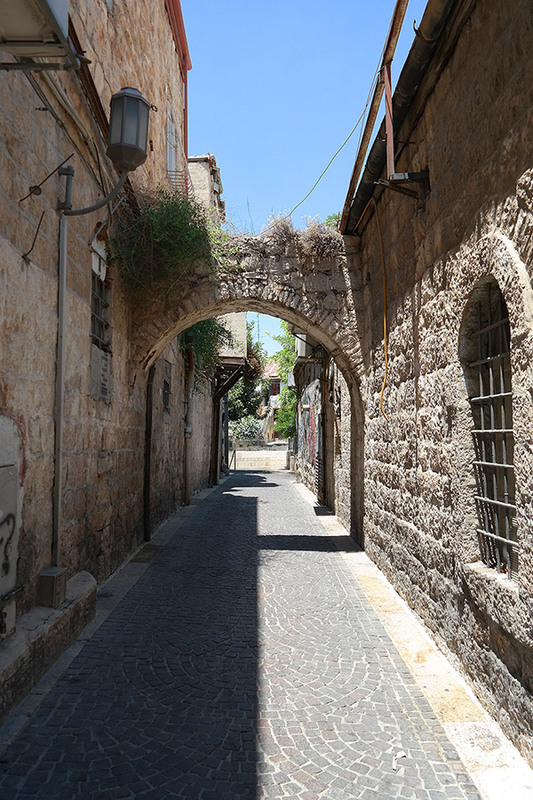 There is a magic to this place that is discernible from the moment it comes into view, from the 16th-century Ottoman-era walls to the maze of ancient limestone-cobbled alleyways lined with thousand-year-old shops, hovels, and some of the most important religious monuments known to man. 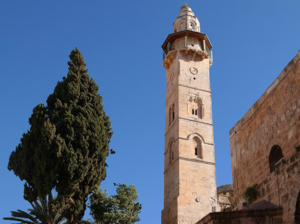 The Old City has charm and history and energy – a culmination that only enhances the fact that this is literally the crossroads of the world’s most prolific Abrahamic religions – Judaism, Christianity, and Islam. 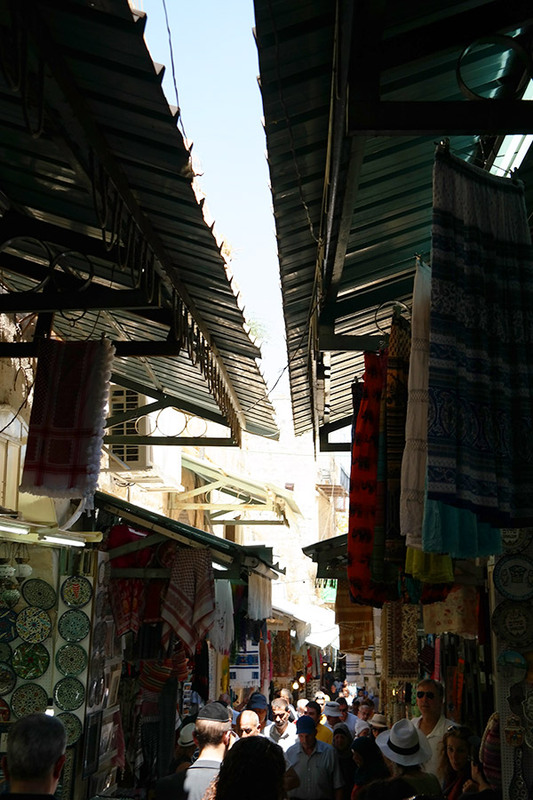 Meanwhile, the shops in the souq were calling. 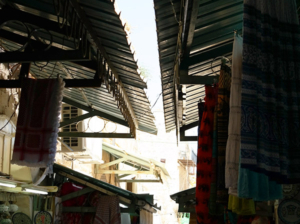 From one stall to the next, shopkeepers were hocking their wares left and right. 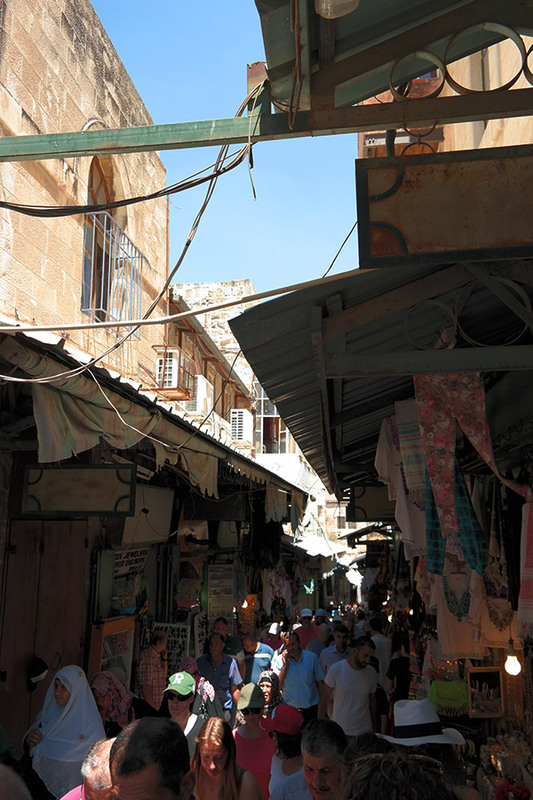 There was religious paraphernalia, dried herbs and spices, Arabic desserts, fresh and dried fruits, kitschy and catchy t-shirts, Jerusalem pottery, jewelry, toys, costumes, candy, leather goods, silk and wool scarves, pashminas, and the list goes on and on. You name it, there was a shop that sold it. 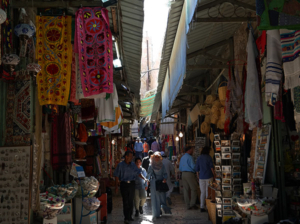 Many of the shopkeepers were aggressive, and as is the custom in the Middle East, they like to haggle. 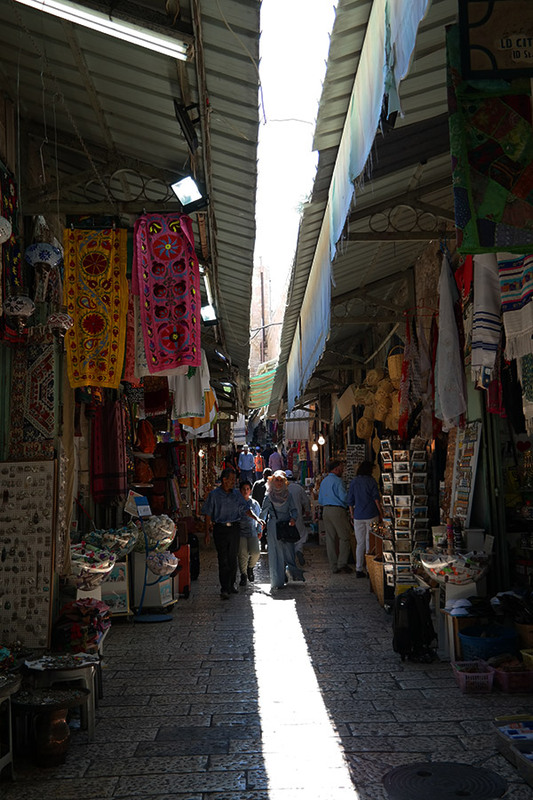 In most cases, a price tag is merely a starting off point for a drawn out negotiation. 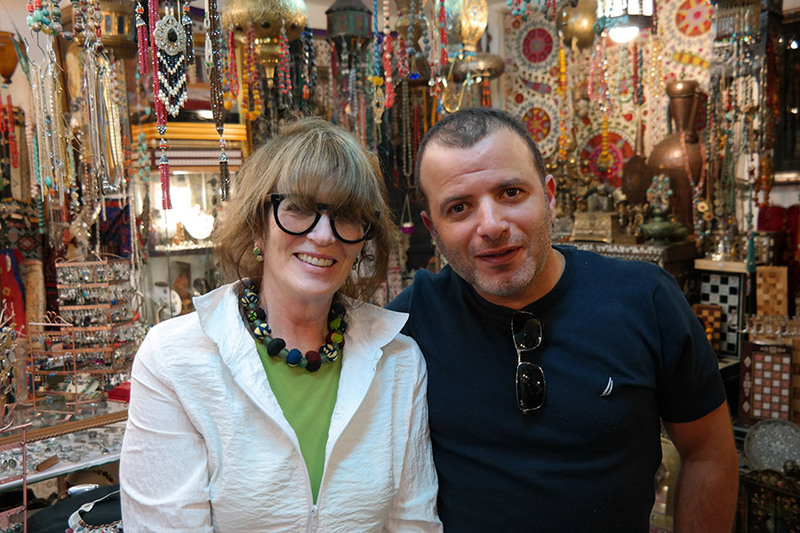 A friendly young man summoned us in to his jewelry shop, Sinjlawi, to show us one of the oldest Roman wells in the Old City. 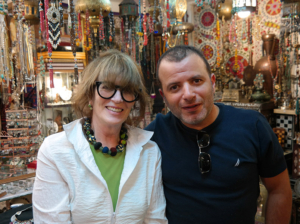 His name was Yousef, and his family had been in the jewelry trade for over 300 years. He ran the shop with his brothers, all skilled and talented jewelers. Our whole gang ended up in the shop, and we had a field day! The brothers were working their magic on the women, pulling out beautiful pieces to try on – Roman glass pendants, charm bracelets fashioned out of ancient coins, stunning statement necklaces adorned in lapis, coral, and carnelian. And for the men, we were draped in colorful scarves, made locally with wool shorn from the necks of sheep. To boot, we were given a demonstration on how to tie a scarf seven different ways. Who knew a man’s scarf could be so versatile?! 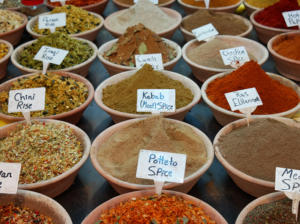 From Sinjlawi, we made our way in and out of a few spice shops. 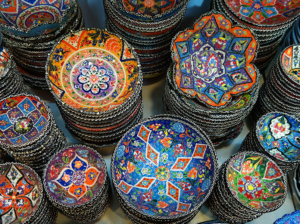 Barrels overflowing with spices is a ubiquitous sight throughout the souq…but a sight that never gets old. 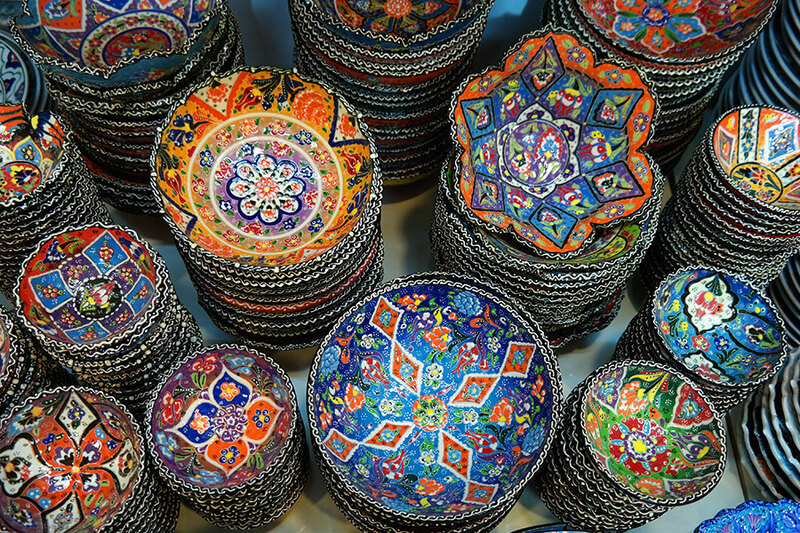 From the vibrant colors to the intoxicating aromas – I was in my element. 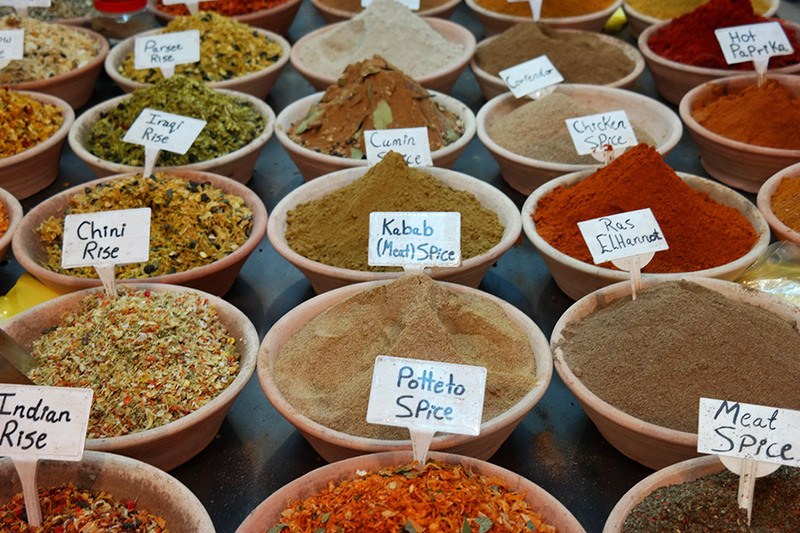 I particularly enjoyed discovering spices and blends that were foreign to me, like baharat, a typical Middle Eastern blend containing black pepper, cumin, coriander, clove, cardamom, paprika, cinnamon, and nutmeg. Each shop had its own blend of ras el hanout, a spice mix I had heard of before but had no idea it could contain up to 20 different spices like grains of paradise, nigella, ginger, caraway, rose, anise seed, mace, chamomile, and lavender. And then, of course, there is the all mighty za’atar. Made from sumac, thyme, sesame seeds, hyssop, and oregano, this spice blend is used generously in many Israeli dishes. 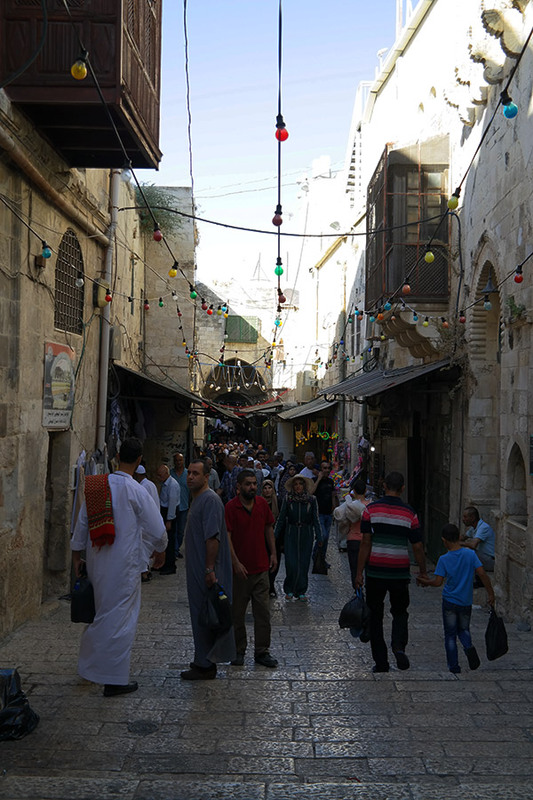 After the souq, we met up with the rest of our fellow missionaries and together we trekked through numerous connecting alleyways and portals until we reached the Church of the Holy Sepulchre – the holiest Christian site in the world. 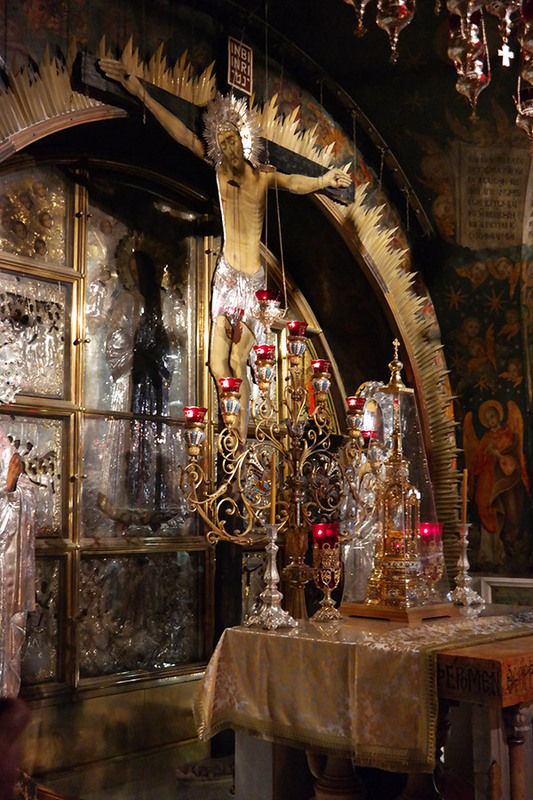 It was here in the 1st century where Jesus of Nazareth was crucified, buried, and resurrected. 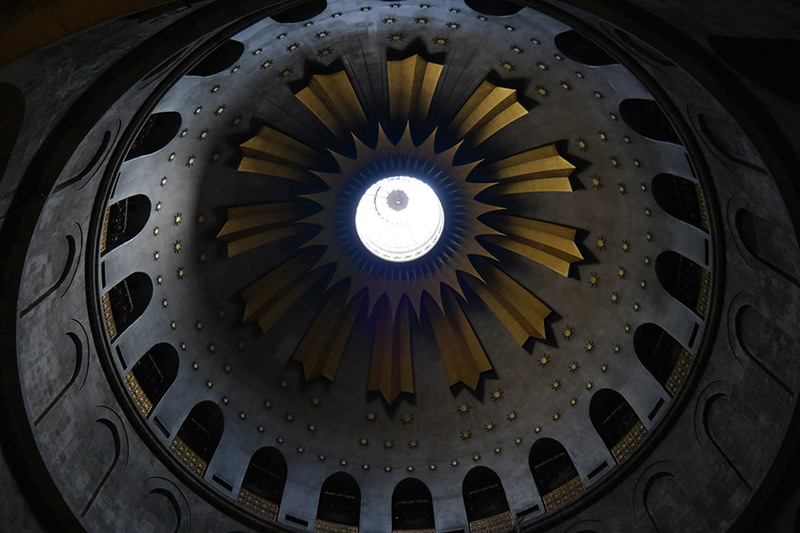 The sepulchre refers to his empty tomb, which lies enshrined at the center of the church. 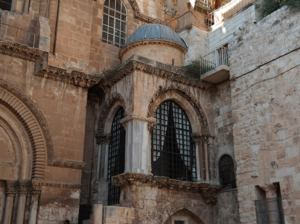 Some religious scholars believe the church could be located over the actual tomb of Jesus Christ. 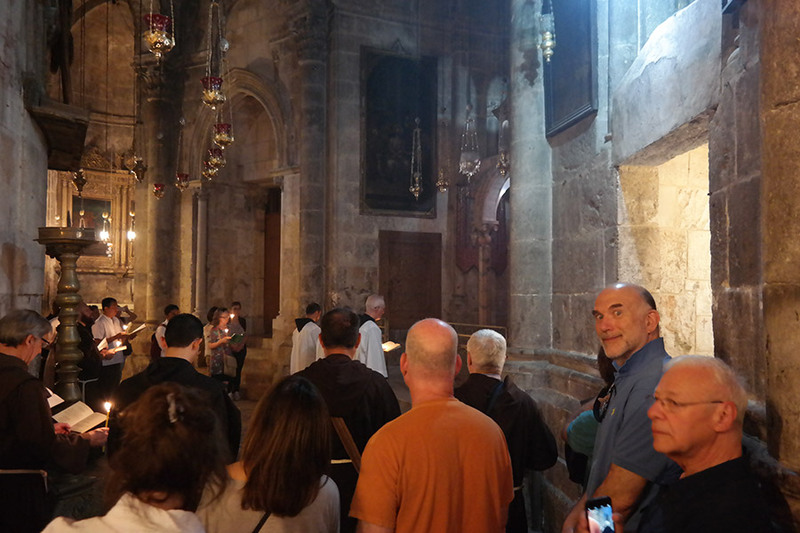 Inside the church, we climbed a steep and narrow flight of steps that led to Calvary, the place were Jesus was crucified. 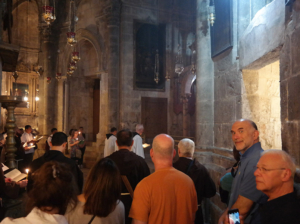 We also witnessed a Franciscan procession in one of the side chapels on the main level. 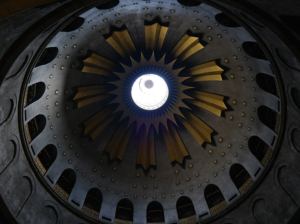 And before leaving, I marveled at the beauty of the natural light seeping in from the oculus of the dome above the sepulchre. 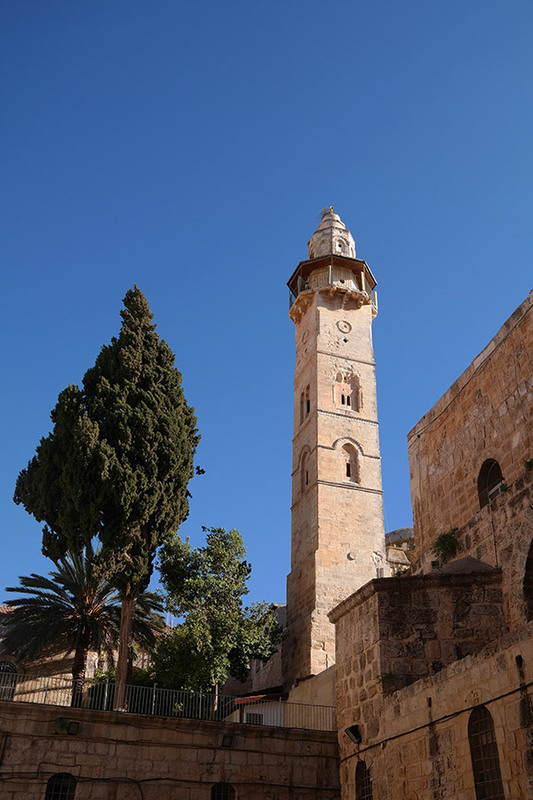 It was a curious experience, being in the presence of a vestige with such spiritual and historical significance to so many. 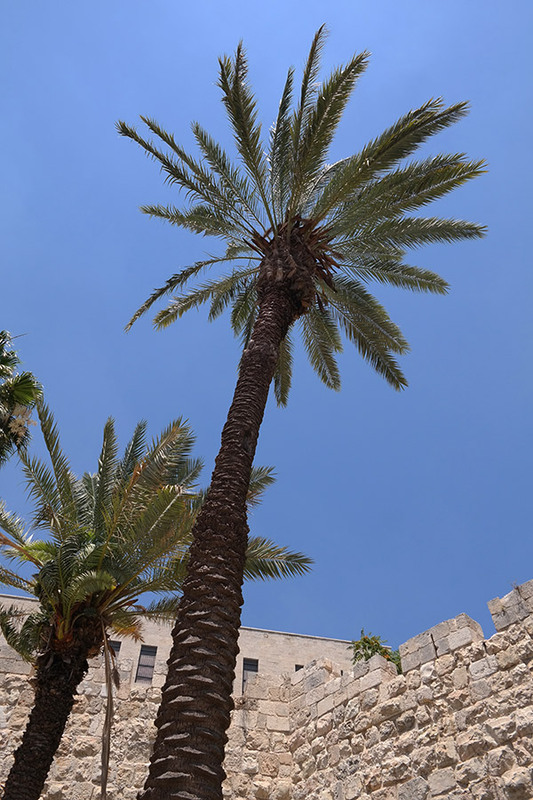 From the church, we continued on through the limestone labyrinth of the Old City’s streets and passageways, eventually rejoining the main thoroughfare of the souq, which led us to our final destination – the Western Wall. 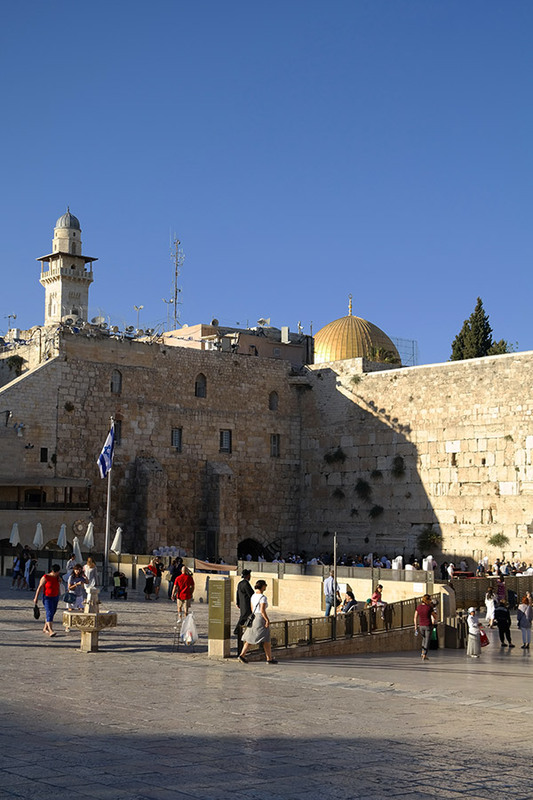 Many people mistakenly refer to this as the holiest Jewish site in the world (myself included), but rather, it is the holiest site where Jews are permitted to pray. 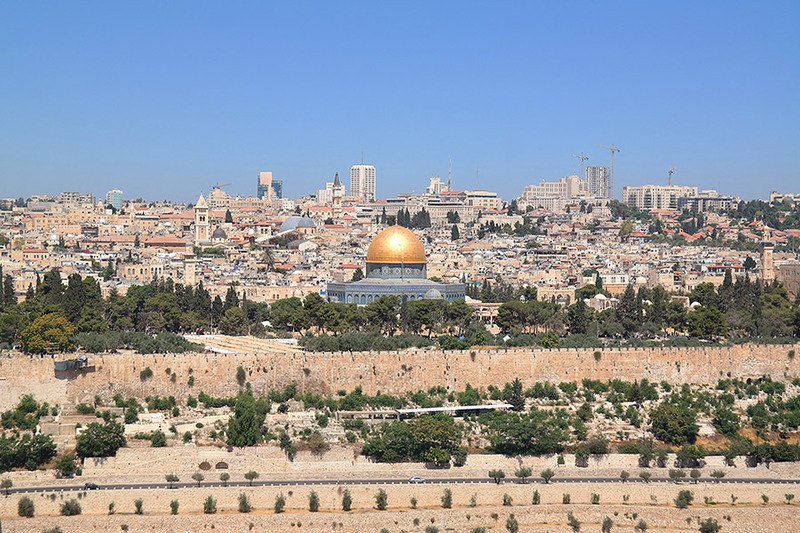 The actual holiest site is the Foundation Stone, which is essentially exposed bedrock beneath the Dome of the Rock upon which the Temple Mount and the First and Second Temples were constructed and subsequently destroyed. 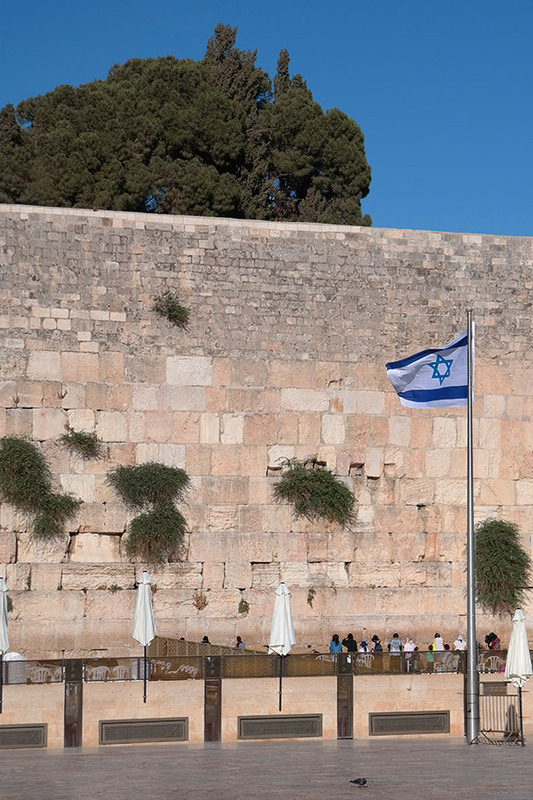 Due to its proximity to the remaining Temple Mount, the Western Wall became a spiritual and religious sanctuary for Jews throughout the ages. Upon entering the plaza in front of the wall, I took a moment to be at one with my own thoughts before proceeding onward. 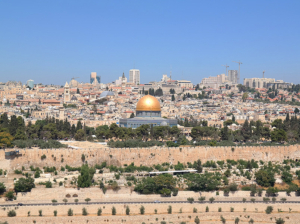 It was an emotion-filled experience, witnessing this holy of holy sites with my own two eyes for the first time ever. 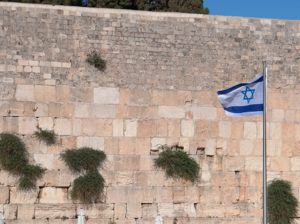 I am not a religious Jew, but I am still a Jew…and this wall, this all-encompassing wall with such meaning to the Jewish people – it just resonated. 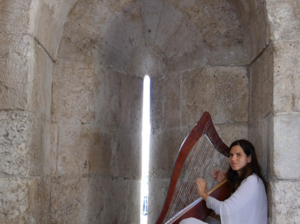 I instantly felt a connection to my ancestry, my heritage, and my religious upbringing. 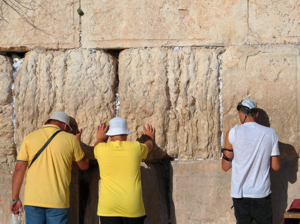 I wasn’t expecting to bond with the Western Wall the way I did…I was pleasantly surprised. 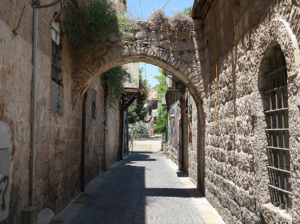 It was Friday at 4 o’clock, and we pretty much had the wall to ourselves because most other Jews were at home preparing for Shabbat. 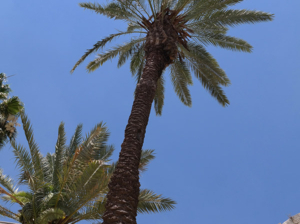 The late afternoon sun set the limestone aglow against the cerulean sky. I walked up and touched the stone bricks. I didn’t feel compelled to write out my wishes and leave them in a crevice, as many people do. 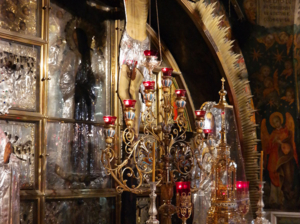 I also didn’t feel an urge to pray, which is not something I do with any regularity. I just stood there, communing with the wall and soaking in the moment. 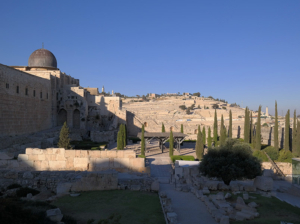 In the background, I could hear the Muslim call to prayer from Al-Aqsa Mosque, which sits atop the Western Wall high on the Temple Mount. It struck me as ironic. 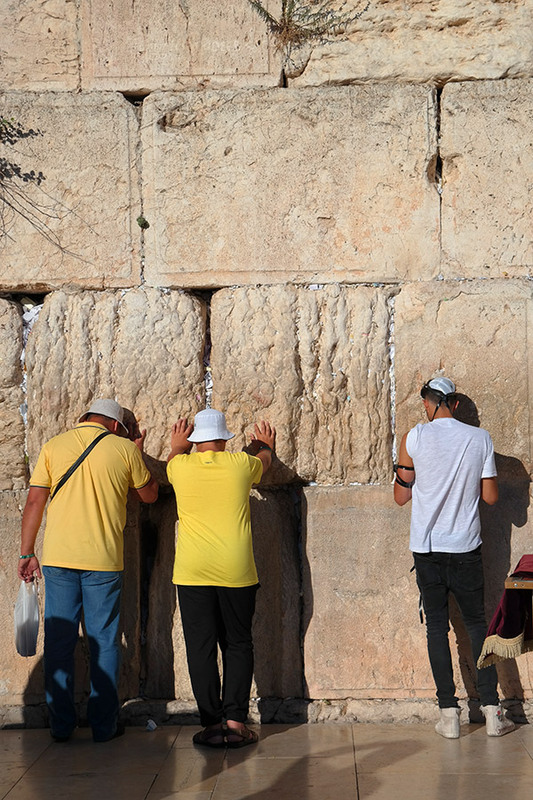 Around me were devout Jewish men wearing tefillin, tzitzit, and tallit, making their final prayers to HaShem before welcoming in the Sabbath. 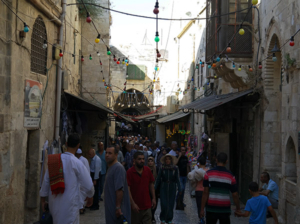 And only a few yards away, devout Muslim men were making their way to the third holiest site in the Islamic world for Asr prayer on the 21st day of Ramadan. 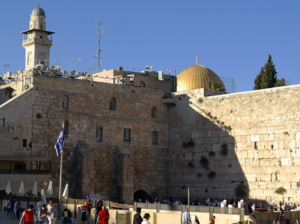 These two faiths, often at odds with each other, were praying together. 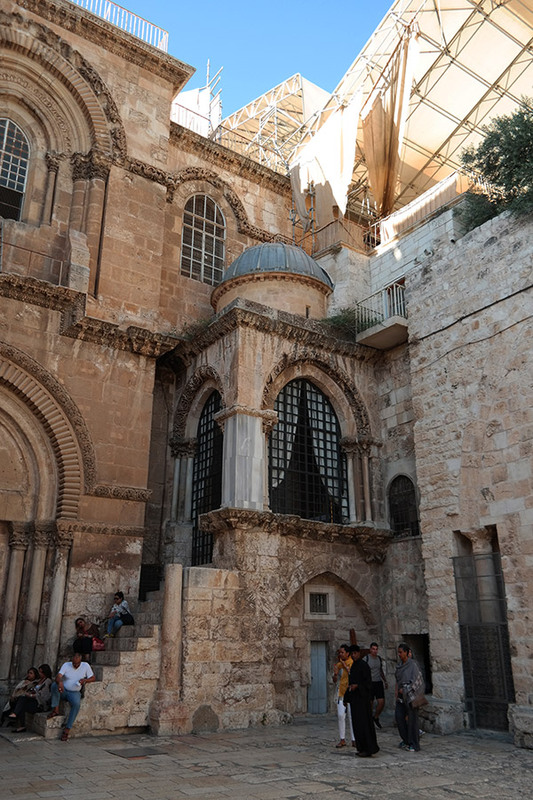 And just blocks away, Christians from the world over were making pilgrimage to the site where their savior, Jesus Christ, was crucified, buried, and resurrected. It was in this moment that I truly understood the force, the power, and the sphere of influence contained within this tiny little spec on a map. 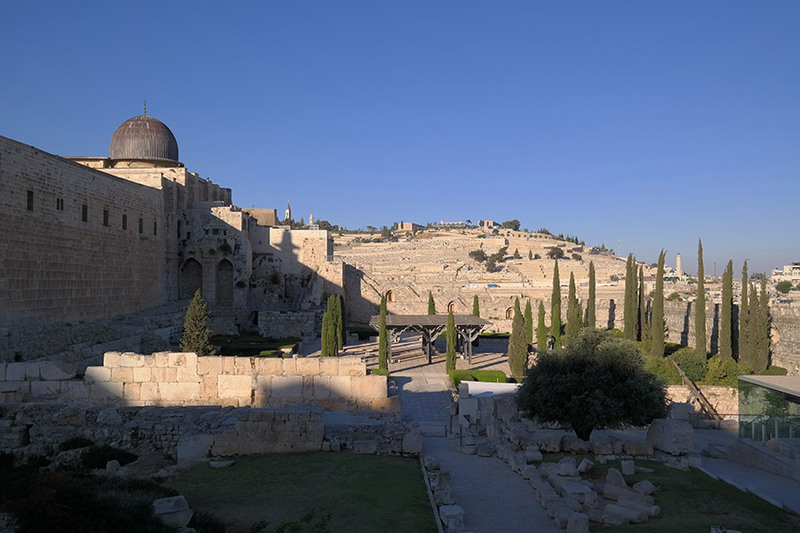 For me, only after witnessing and experiencing these sites in the flesh was I able to fully grasp the magnitude of the Old City of Jerusalem.